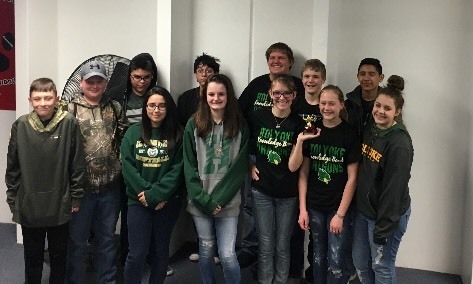 On Friday, March 9th, the Holyoke Junior High Brain Bowl Team went to Burlington to participate in a competition. All of the teams did great. The teams that went were 7th grade A team, 8th grade A team, and 8th grade B team. The 7th grade A team placed 5th in their age division. The 8th grade A team placed 3rd and 8th grade B team placed 5th in their age division. One of the 7th graders that participated in the competition was Erin Andersen. She was on the 7th grade A team. The people that were on her team were Jimena Nunez, Cooper Goldenstein, and Clover Adler. Altogether, there were four rounds including the written round. Congratulations to all that participated!